For adding media content such as audio, video or picture files, the player relies on Microsoft’s Media Transfer Protocol (MTP). So, contrary to what you might be used to from other players or USB sticks, it does not support Universal Mass Storage (UMS) for adding media content. In other words: this little nice machine only works under MS Windows® XP SP1 + later! However, since Creative’s engineers apparently aren’t THAT mean, they included a function where you can asign a partition of the internal 1,8″ Toshiba HDD at fixed sizes (512 MB / 1 / 1,5 / 2 / 4 / 8 / 16 GB) to work as an external harddrive. The problem, though: data that’s uploaded to that partition can not be played. This might change with future firmware releases, but in the meantime, this is just a major drawback, as I was expecting this little player to have one partition only where you can add any data from any USB-supporting operating system in a drag-and-drop style. Who’s responsible for such decisions over @ Creative? Stupid! There is no folder structure you might be used to from other players. All audio files are identified by their ID tags, such as the popular ID3 tag as found on mp3 files. That is, IF you managed to rip your CDs while using ID3 tags, you are on the save side. Else, like in my case – as I started ripping my CDs / converting music files into mp3 format as early as 1998 or so when I was still too dumb to realize that there might a feature use for ID3 tags on mp3 files – you’ll have to edit these tags. Whereas this might be a one-time procedure only, you can well imagine how time consuming this task is once your music collection exceeds 160 GB….On the other hand, though, this is an inevitable necessity for any future use of mp3 files, so you’re better of starting today with this procedure. Fortunately, there are few nice programs out there that will help you retagging your files (keywords: mp3 tagger). Battery runtime is limited to 11-14 hrs (depending on usage & played file types) – which of course is nice, but it only has a fixed Lithium-Ion battery pack inside that can only be exchanged once the player is opened. Since this gadget here is rather new to the market, spare parts and accessories are still to become more and more available in future. As I haven’t been using any other modern player like these iPods before, the user interface with this vertical scroll/touch pad is just brilliant to me. In fact, it is such a joy to play around with it. While it is a bit too sensitive of course, it doesn’t take long to get a feeling for it. Actually, I had plans of exchanging this player for a (cheaper) monochrome Archos Gmini XS 202S 20 GB audio-player-only because of Archos’ UMS ability and folder structure support. The ZVM’s user interface though made me fall for this neat player in the long run. Like many other players, this one comes with a proprietary dock connection. For connecting it to your computer via USB, to recharge it via USB / an external power supply (included! – these things have to be bought seperately with iPods!) or to connect it to your tv / stereo / car audio system (A/V-Out = LineOut), the player comes shipped with a little white dongle that connects to the bottom of the player. It has been designed in such a bad way that one ultimately assumes Creative’s engineers must have had a bad day or weren’t payed for being really “creative”. It’s just a cheap little plastic connector that doesn’t look good in any way and presumably is the first thing that will get lost once the player is in heavy use. Again, who comes up with such uncreative creations over @ Creative? I was expecting this dongle – if at all, as ppl on Creative’s forum said they would rather like to have the player be a bit longer and include all these sockets – to be shapped like the rest of the player. Needless to mention, of course, that the connector itself isn’t available from any specialized electronic spare part dealers (btw, is this RS Electronics shop still on Moi Avenue? I’ll need to check this out asap), so there won’t be any way of making your own connector/docking station. Anyways, the A/V cable is also said to be “special” – the wiring inside has been changed so that customers are forced to buy a special one. 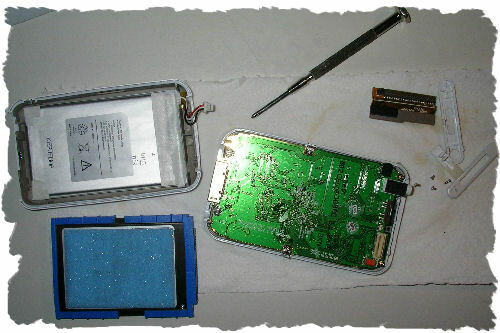 I will built my own, yani, this page suggests that Apple’s iPod Video caboooools also work. Either way, maintenance / spare parts / accessory costs are, as usual, the biggest revenue on these devices..
As with many other modern players, the surface is scratch sensitive, so make sure to apply some additional screen protector films which are available all over the internet to avoid further scratches. Also, some components used on this player are very “soft”: there’s this RESET pinhole at the bottom of the player which is already worn out after only resetting the player once. Again, no spare parts in sight for this optical/reselling problem. Fortunately, the player connects to my stereo system or even the car audio system through a normal 3way 3,5mm jack – which is the most important thing for me (you’ll still need the above mentioned A/V / camcorder-cable for video output in PAL or NTSC). I just want to have a portable storage system that plays (parts of) my music collection the moment I need it whenever, wherever. I would have sticked to the mp3 player in my mobile phone – but that one only has this 256 MB MMCard which is of course nothing compared to these (formatted) 28 GB of data on the player. The more harddisk space, the better it is. The day there are 200+ GB data players available at this pocket size, I will eventually drift away into a self-chosen world of musical pleasure. Battery runtime would be an issue though, but that’s another topic I’ve mentioned earlier. Speaking of connectivity (did I alread mention the missing UMS support? No? :-), the player starts recharging the battery whenever the USB connector is inserted. Whereas this is a nice feature, it also means that you can not recharge the player via USB and output any a/v data at the same time. However, simultaneous a/v output and recharging works with the external power supply. Interesting point to remember when you connect this thing to a tv set or even a beamer (cool!). Since this PMP device plays even cpu intensive videos like XviD encoded files, there’s much more code expected to be implemented in feature firmware releases. Also, as Creative seems to be having plans for bigger models up in their drawers (60 GB? ), further improvements on the firmware can be expected. You know, with today’s fast product cycles, it isn’t always clear how long developers will be working on a specific model before they skip it for another better, but also completly different model. Let’s hope there’s still a lot of features they’ll include on this gadgetimoja (UMS support, pliiiiiiiiizzzz, Creative, tafadhali, we’ll need this!). Another useful information might be that my ZVM came shipped with a european firmware version whereas there’s another firmware edition designated for the US market. 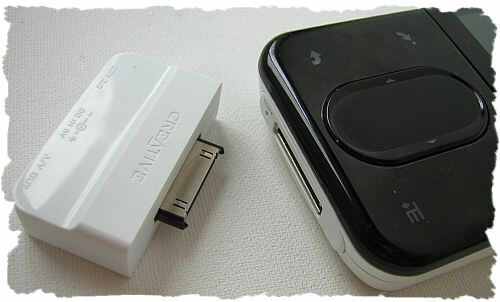 The difference between both versions is that the US version – similar to the iPod – has a higher headphone jack output level. So to increase the overall output level on your headphones, an upgrade to the US firmware is recommended. As for the hdd partition for use as an external hdd: I’ve set mine to 8 GB, uploaded a few ebooks for references while on safari, a Knoppix + Ultimate Boot CD image as well as other useful programs / utilities / private data. Once again, A BIG THANK YOU to the generous person who gave this little toy to me! Okay, this is about as irrelevant as anyone can get, but apropos the blog awards, someone –gosh, I wish I could remember whom–wrote that s/he intends to expose to the world that “kikuyumoja” is really “wakamba wawili.” It is true that I laughed so hard I sat down and then fell off my chair. I LOVE KENYAN BLOGGERS!!! Loved your review on the Creative Zen Vision M. I had one that I had put all my music and photos on in readiness for an upcoming trip to Kenya, but it was stolen from me last week here where I’m staying in the UK. I want to replace it, and was thinking it might be cheaper for me to buy one in Nairobi rather than buying another one here in UK before departing. Can you please tell me if there is somewhere in Nairobi where I could buy one? Now, I have some ideal how to proceed in hacking my own Zenpod. Because, I have Zen Vision:M 30GB HDD and I wanted to upgrade to 80Gb or 120Gb. Since, this will my first time updated and hacking into my ZEnpod. Is there a limit that ZEN can handle? Will it handle the 120Gb? Also, how much can rpms will ZEN Vision:M can handle? By the way, where or how can I get a circuit diagram (electronic schematic) of Zen Vision:M?